It happens many time when we need to download the .NET Framework separately to work with some application softwares and finding it sometimes become difficult. I had a list of the redistributables since a long time (as much as I was able to collect) and thus thought to share it with you, so that, you can also find it easy when you really need it. Find below the versions and it’s related Web Installers and Offline Installers, wherever it was possible. In case I missed any, please share them in the below comments section to include them for you and other fellows to refer later. If you like the post, don’t forget to share it with others in your network. The above redistributable links are from Microsoft servers. Neither me nor this site is responsible of this hosting. Though the installers were already scanned for viruses by Microsoft itself, but it’s always advisable to scan them after you download. 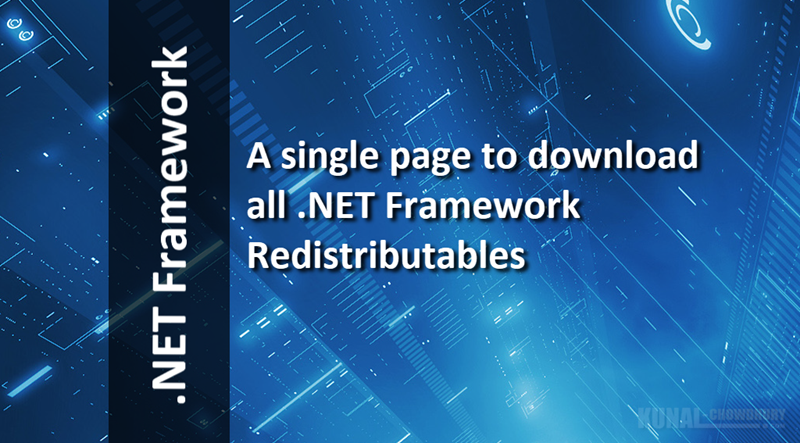 If you have come this far, it means that you liked what you are reading (A single page to download all .NET Frameworks (#dotNet)).